The big day is finally upon us! It’s time to get out there and vote, and finally bring the wacky 2016 presidential election season to an end. But will the outcome trigger a mass exodus of the citizens of the United States? For months now, we’ve seen thousands of social media posts from disgruntled Americans promising to move to Canada if Donald Trump is elected, and Canadians in provinces with low populations — like Nova Scotia’s Cape Breton Island — are even starting to get excited about a wave of liberal-minded newcomers. More: 11 things feminists should brace themselves for if Trump wins. Interested in making the move to Canada? First things first: Get a passport. If you pay US$60 extra for expedited service, this can take as little as eight business days at an agency, but otherwise you’re looking at a wait of about six weeks and a price tag of around US$110. Only 38 per cent of Americans have passports, according to data from the U.S. State Department — a lower number than you’d expect in a country full of people threatening to move away if Trump wins (by contrast, over 60 per cent of Canadians have passports). Once you have your passport (or NEXUS card), you can stay in Canada for 180 days without a visa. You can keep your U.S. citizenship and apply for a permanent resident card. (Depending on the type of visa you apply for, your fees can be up to CA$1,050 — check out the list of application fees here.) This card gives you permission to live in Canada and get many of the benefits of citizenship that Canadians get, such as free health care, protection under Canadian law and the right to work, study and live anywhere you want in Canada. Some rights, like voting in elections, are still off limits, as you’re not a citizen, though you can apply to be one once you have the permanent resident card. The only catch? You have to commit to living for two years of a five-year period in Canada, or you may lose your card. Also, it takes over a month to get your application processed (approximately 38 days). Check to see if you’re eligible to apply for a permanent resident card using the Government of Canada’s online tool. Not everyone is eligible to apply. For instance, if you live below the poverty line, are self-employed and want to move to a major urban center like Toronto, you’re not likely to get your application processed. Your chances of becoming a resident are stronger if you can offer Canadians something that they need. If you’re a skilled worker moving to a region with a labour shortage, for example, you’ll be more likely to get a visa. Whatever you do, don’t just show up with a U-Haul full of stuff at the border without taking the time to get the required documents in order, because you’ll likely find yourself driving straight back home. Get your residency documents and work visa (if applicable) in order before shipping all your stuff to Canada. Be sure to write detailed lists of everything you pack, because you’ll need two copies of an inventory list of items you’re shipping and the value of each, as well as two copies of a list describing any items you plan to ship or mail yourself later. You can make the moving process easier by teaming up with an international moving company like Mayflower, which lists plenty of useful tips for Americans moving to Canada. The United States makes relocating particularly tough for Americans who want to keep their U.S. citizenship, as it’s the only country in the West that continues to tax you after you’ve moved to another country. Americans are still required to file tax returns with the IRS each year even if they’re not living in the United States. But fortunately there are some ways around double taxation. If you live the majority of the time in the U.S., you may qualify for the Foreign Earned Income Exclusion, which can exclude up to US$100,800 of your earnings from U.S. taxes. If you’re not careful, you may wind up in Canada with zero credit, regardless of what your credit was back in the U.S. Some international banks, like HSBC, do allow clients to transfer their credit histories over to a new Canadian branch. This will make it much easier to do things, such as buy a home, get a Canadian line of credit and apply for loans in Canada. If you’re unable to transfer your credit history and find yourself starting at nothing, you can build your credit slowly by getting a prepaid credit card or getting a card from a store, like a gas station or grocery chain. It’s not ideal, but it works. 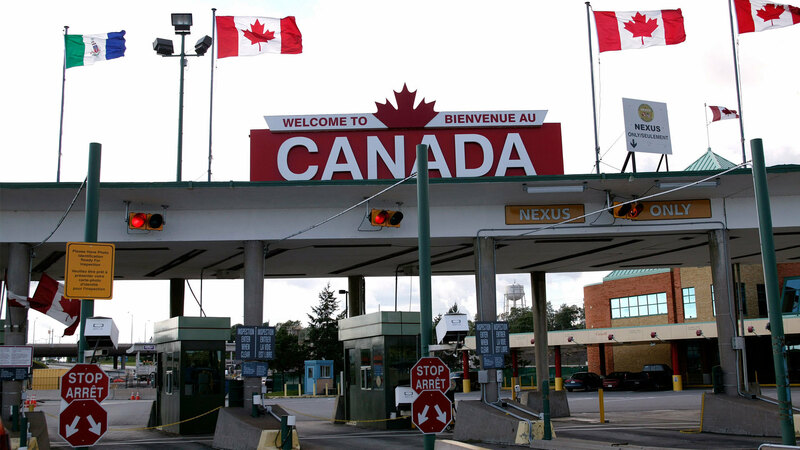 Moving to Canada may be trickier than you imagined at first, but it’s not impossible. Try visiting first to see if you like us — we’re pretty sure you’ll find yourself just as hooked on our poutines, kitchen parties, clean air, free health care and pedestrian-friendly streets as we are. Originally published March 2016. Updated November 2016.